The i38 is an amazing pressing tool. Hook it up to our i500, i700 or i702 steam boiler (or your steam source of choice) and watch how much steam comes out of this little dynamo. Great for distribution centers, retail stores, and auto / home upholstery applications. 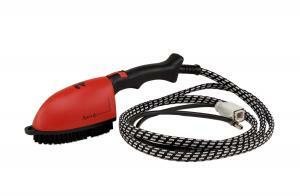 The i38 is the perfect tool wherever you need high pressure steam delivered in a comfortable and easy to use brush.